Pioneers in the industry, we offer ladies pu sandals and pu wedge sandals from India. Being a renowned manufacturer, trader, exporter and supplier of the market, we are offering an excellent range of PU Wedge Sandals. 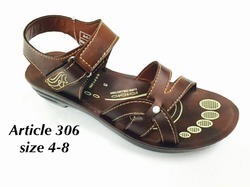 These sandals are designed using the supreme quality material by our accomplished professionals. The offered sandals are quality checked by our quality inspectors, in order to assure its quality. Offered sandals are acclaimed in the market owing to its high durability. Furthermore, patrons can avail these sandals from us at reasonable prices.